Find everything you need to know about Ancient Wonder reward chests, here. Rewards are paid in the form of Ancient Wisdom instants. The charts list total KP value of all instants awarded. Denominations of instants received are not included because these can be determined based on the total. While many denominations of AW KP Instants are available in the game, only 20s and 5s are used for the chest rewards, making much easier for us to see what the rewards are in game. Rewards are displayed in the game with small icons which are marked with a blue or purple triangle. These indicate the values of the Instants you will receive. 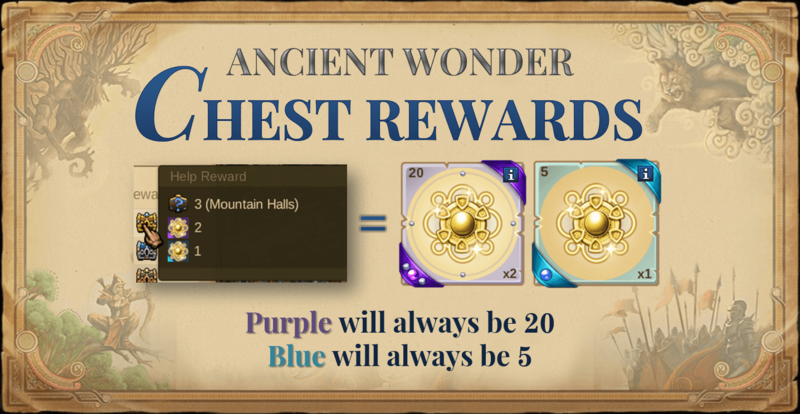 The rewards are paid when the research is completed, regardless of when the Ancient Wonder is actually upgraded. You will receive a notification for any reward that you receive, but it is just a notification; not when you should expect to receive the reward. Select any wonder from the drop-down menu to display the reward chart for that wonder.